It’s here, again. 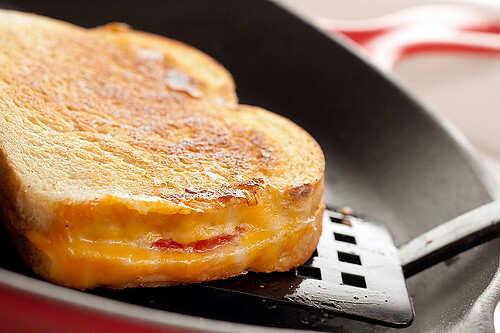 TheÂ famous Grilled Cheese Invitational is back and bigger than ever – and ready to press. You may have heard in past years how crazily crowded the event has been, and with good reason – Is there a more loved sandwich out there? Thankfully, Tim Walker, who started the event back in 2003, and his team have spent time revamping and redesigningÂ the invitational: You can get your tickets in advance! There will be separate categories for amateur and professional competitors! You can register pre-event to be a judge! Even…a costume contest? And if you want to register to compete, you can still do that – so long as they haven’t reached their cap of 300 already. The categories of competition are Missionary (bread, butter, cheese), Kama Sutra (freestyle) or Honey Pot (freestyle, dessert). Also be sure to check out the rules of the competition. If you want to help out, theyÂ are also asking for volunteers. This year, the invitational is sponsored by Tillamook Cheese, who will be culminating their Love Loaf tour at the event byÂ giving out samples of their cheese. See you with sammich in hand! This entry was posted in Downtown LA, Events, Food and tagged @grilldcheez, grilled cheese, Grilled Cheese Invitational, L.A., LA Center Studios, los angeles, paninis, Tillamook, Tim Walker. Bookmark the permalink.